Birds love Churchill in the summer months when the Arctic food chain grows exponentially to take advantage of the short warm season. The tidal pools and coastlines are teeming with plankton, krill, capelin and many other food sources unmatched by any other region in the world. The pure number of birds migrating to Churchill in the spring certainly is a testimony to the bounty of the Arctic. Hudsonian Godwit in flight. A. J. Hand photo. Nearly 250 bird species appear in Churchill over the course of the year. Most of those are “summer” migratory species while some reside in the region year-round. Personally, I feel the ones that come and go tend to be more intriguing. Today’s focus is on the Hudsonian Godwit, a large shorebird with a long, upturned bill. This bird breeds in the Arctic and winters in southern South America. Because of its remote breeding and wintering grounds the godwit is one of the more obscure American shorebirds. 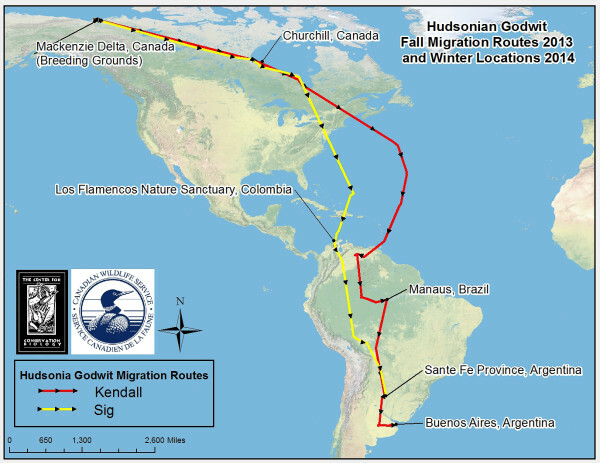 Fall migration routes for Hudsonian godwits Kendall and Sig. Significant staging areas were documented along Hudson/James Bay and within Colombia, Venezuela, Brazil, and Bolivia. Map by CCB. Nesting on the mixed tundra and wetlands of northern Canada and Alaska, the godwit travels across the great plains of the United States in the spring then returns south along the Atlantic coast to South America in the winter. Reported nonstop flights of several thousand miles between these sites are not uncommon. At times, in the fall, “touch-downs” on the Atlantic coast are necessitated by northeasterly winds. The long upward bill of the godwit digs in muddy, rocky or sandy shorelines as well as marshes, mudflats and flooded tundra or fields. The length of the bill allows it to search deep in the earth to acquire insects or organisms unreachable by other foragers. The Hudsonian, however, is the smallest of the four godwit species. In my guiding days I would associate the upturned bill with “god”, (heaven generally thought of as above in the sky) in order to help identify the bird from a distance or while mixed in with other shorebirds. Whimbrels have similar long bills, though slightly curving downwards, and dowitchers have more straight, dagger-like bills. All three are found on the shores of Churchill in the spring and summertime. Due to their similar feather markings and size, the bills are quick and easy identifying symbols. Hudsonian Godwit in breeding plumage. Seth Kellog photo. Once thought of as one of North America’s rarest birds it now is know to be more prolific. Vulnerability for the species remains quite high as the population is confined to only a few locales geographically. When found in groups, godwits are generally collectively known as an “omniscience”, “pantheon” or “prayer”. A “prayer of godwits” fits quite nicely with my bill reference for identification. These birds truly are incredible in all facets of their lives. If you have the urge to track the summer life cycle of the Hudsonian Godwit, come to Churchill with Natural Habitat Adventures! Visit nathab.com for details.